← More Backyards Than Time…Where Did Summer Go? You wouldn’t know it from the mild temperatures here in Des Moines and Central Iowa, but its Thanksgiving week and Christmas and New Years are right behind. 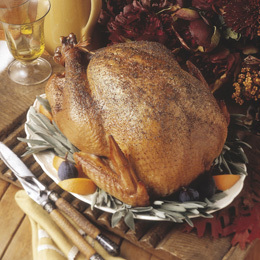 The celebrations and gatherings of the Holiday Season ahead are centered as much around food and its preparation as the holidays themselves. Kitchens – indoors and outdoors – will soon be bustling with activity and bursting with aromas of turkey, potatoes, pies and all the other goodies you put on your holiday dining tables. Wait a minute….did that just say kitchens…outdoors? Yes it did! 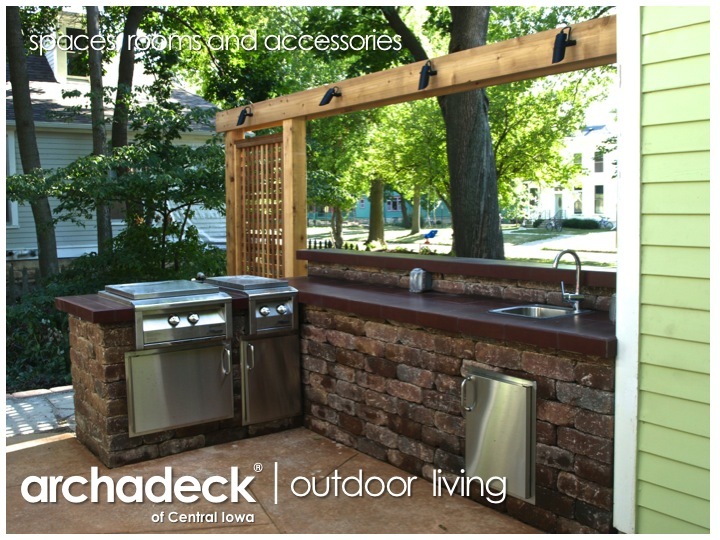 We are designing and building more (in fact, a record number this year…and more in the queue for next) outdoor kitchens as they become a key ingredient in what our Des Moines and Central Iowa clients want in the outdoor living spaces we develop for them. In many cases, the outdoor kitchen is the focal point of the patio or deck space. Outdoor kitchens can take on many forms and serve various purposes. At a minimum, the outdoor kitchen can provide counter space adjacent to an existing grill integrated into a broader cooking area. Two patio projects we did in Des Moines suburbs this summer, one in Johnston…one in Urbandale, exemplify this approach. At the other end of the spectrum, outdoor kitchens can be configured as well as – if not better than – an indoor kitchen. These higher-end units can be custom-developed with an assortment of built-in components for all your outdoor cooking and entertaining needs. Components available include grills, burners, sinks, refrigerators, drawers, bar/condiment caddies, storage doors and more. An outdoor kitchen project we did along the back roads of southwest Iowa included much of that…and a nice nook for a Big Green Egg. In between, there are any number of outdoor kitchen styles, sizes and configurations to suit the chef in your home; examples of this in other projects we’ve done around Des Moines and Central Iowa are scattered throughout this post. 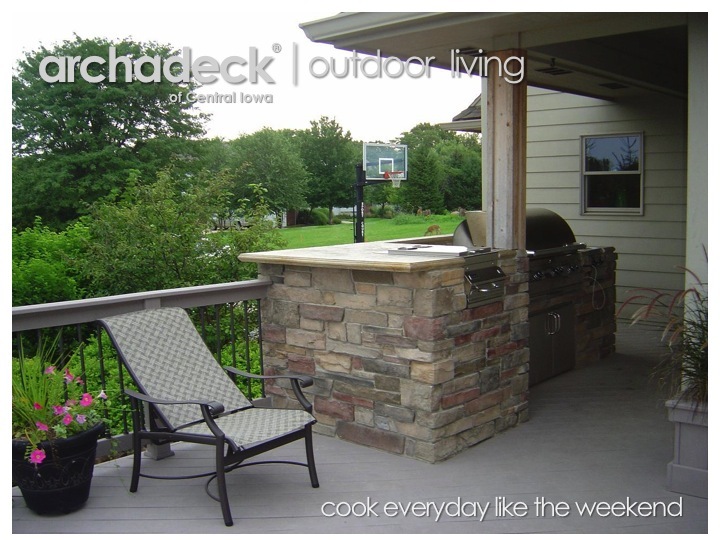 Additionally, check out more photos in our Outdoor Kitchen photo gallery on our web site. 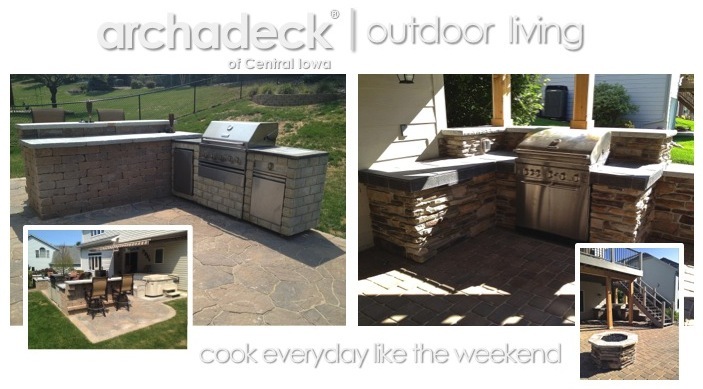 Or, if you prefer Facebook, check our Outdoor Kitchens album in our ArchadeckCentralIowa Facebook page. Outdoor Kitchen with Bar Caddy and Bar…and deer! The key to the success of any kitchen – indoor or outdoor – is knowing what the chef wants and needs and that is our focus during our custom design process. No, we won’t kiss the cook, but we do want to get to know them well! Our goal is to build the kitchen you need, not sell you the kitchen we have on the floor (in fact, we don’t have one on our floor). Other aspects of the outdoor kitchen design include placement/location of the unit as well as the materials used in the unit. Again, these are factors we consider in the overall design of the outdoor kitchen itself as well as the outdoor living space it will be built into. Stacked wall stone, such as Belgard’s Weston Wall or Bel Air Wall stone is one choice for the wall finish of the outdoor kitchen. Veneer stone, such as Cultured Stone, is also a good choice offering more style and color choices…and a potential match of existing stone you may have on your home’s façade. Along that same line, brick may also be a good choice and one that may tie into your home’s exterior look as well. Wood and wood-alternative options exists, too; other material options include stainless steel and concrete. Granite is a durable and attractive countertop choice for Iowa climatic swings, in either slab or tile form. Granite tile offers a lower cost option but with grouted seams compared to the more seamless counter a full granite slab would provide. Other stone slab and tile options exist as does concrete and other acrylic combinations, but its important to understand the porosity and maintenance aspects of each and how well they perform outdoors in an Iowa climate that can typically swing over 100-degrees from summer highs to winter lows. A key factor in the placement and location of your outdoor kitchen is generally its convenience and functionality relative to your indoor and outdoor dining and food preparation areas. This is going to depend on the functionality included in your outdoor kitchen and the layout of your home (kitchen, dining, entertaining areas) and its outdoor living space. Sometimes the confluence of the home’s indoor and outdoor spaces lead to optimum placement in an efficient location. Sometimes, that will be the upper deck area; in other cases it will make more sense to have the outdoor kitchen at grade level, on a patio or hardscaped surface. Sometimes conflicts exist with placement and compromises need to be made. They key here is the design of the overall outdoor living space, not just the design of the outdoor kitchen itself. In other words, better building – better cooking – by design…the Archadeck way. Nearly three years ago, I wrote my first “An Outdoor Living Space” blog. Two posts later, just before Thanksgiving of 2009, I suggested that the first Thanksgiving was the first Deck Party. Pilgrims gathering, cooking and feasting outdoors. Three years, 67 posts and 57,000 reads later, I still think the pilgrims had it right. 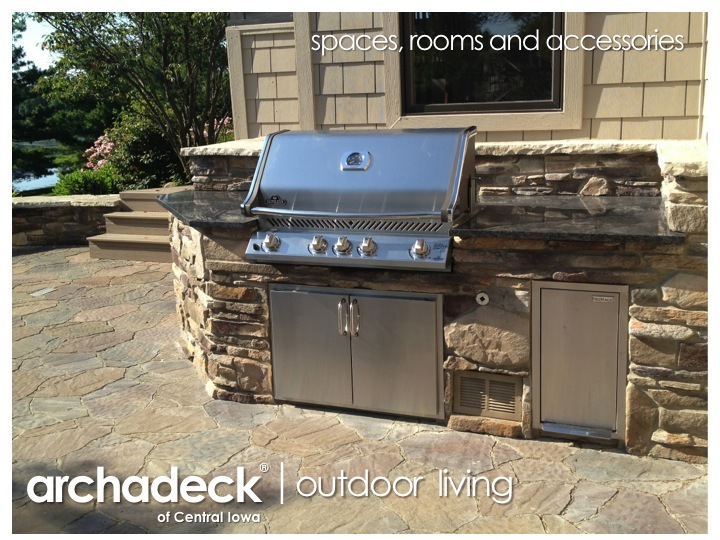 Get your outdoor cooking and dining accommodations right with an outdoor living space with an outdoor kitchen by Des Moines (Urbandale)-based Archadeck of Central Iowa – at Thanksgiving or any time of the year. This entry was posted in Decks and Decking, Outdoor Kitchens, Outdoor Living, Patios and tagged decks, outdoor kitchens, outdoor living spaces, patios. Bookmark the permalink.